The author, D.X. Dunn, gifted me a copy of this book in exchange for my review. If the last book in the Distania series is listed as a favorite, An Unexpected Invitation (The Distania Chronicles) went beyond any expectation that we’d held. Kali, the littlest dragon, returned in An Unexpected Invitation (The Distania Chronicles) and we saw the introduction of the mischievous and brave baby unicorn, Rebecca. 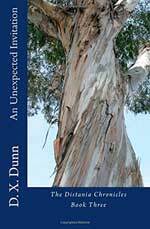 Dunn is clearly gaining comfort in her craft and the dialogue and story flowed well. In An Unexpected Invitation (The Distania Chronicles), Dunn highlights the danger of “right fighting” for the boys. Sometimes there’s not a bad guy but just a huge misunderstanding. They’re able to see how right fighting could go to the extreme and spill over into their world. Alex’s favorite character in this installment of the Distania series was Rebecca. There is a feeling to the character that leads the reader to believe that the author really had fun writing her. She’s beautifully described, spirited and more powerful than she’s willing to let on to the humans. Dunn does not indicate if this is the last book in the series but it does seem like the ending is meant to highlight an event that will happen “off screen” to readers. I’m not such a fan of the off-screen concept but given the nature of the novels, I can see something of a necessity for it. That doesn’t mean I don’t want to see the finale but even if we don’t, I believe I can call this one a great series as it stands. If you have young children or generally like novels for young readers that are well written, pick up An Unexpected Invitation (The Distania Chronicles). For further reading check out my reviews of the two other books in The Distania Chronicles: An Unexpected Twist: Book One and An Unexpected Invitation: Book Two. For more information about D.X. Dunn and the Distania Chronicles, visit her website. You can connect with her on Goodreads, Facebook and Twitter @AuthorDXDunn.